Thank you for your interest in Pu And PVC Belted Elevating Conveyors. We will be happy to discuss the pricing in more detail with you please fill in your details below and somebody will contcat you back with a quote. Alternatively please call us on 01772 690656 and please reference our part number - Pu And PVC Belted Elevating Conveyors. PVC & PU belted incline and elevating conveyors. AS Conveyors offers a variety of conveyors capable of Z-frame configurations. Z-Frame conveyors are used to elevate products or to lower products if run the opposite direction. We offer Dorner Z-frame conveyors with both aluminium and stainless steel construction, covering industries from packaging and assembly, to food processing. We also offer other heavy duty incline conveyors for tougher environments too. 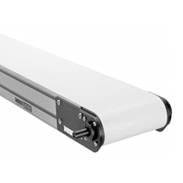 We offer an industry leading 10 year warranty on all Dorner conveyors. No other company in the industry offers a longer warranty. Terms and conditions apply.